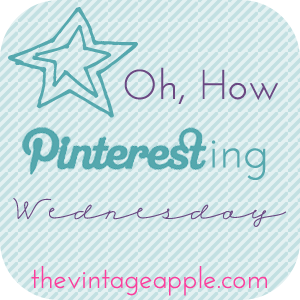 It’s Wednesday which means I’m linking up with The Vintage Apple for Pinteresting Wednesday and you should too! I love these DIY bow bracelets! I feel a new project coming on! I know this is for Christmas, but I LOVE everything about this staircase. I love the empty white frames…..definitely need to do this in my house! Burlap covered bin made from a cardboard box. Why didn’t I think of that? Love this outfit. The hunt for cute leopard flats continues. Aren’t these lights amazing? I would love to have these in my entry way and kitchen. Pinterest makes me want a lot of things. DIY kitchen side table from Ikea. Genius! This is so true! I love to go to Target…it relaxes me. Love the empty frames, the lights, and the Keep Calm image. Oh and the Before and After kitchen side table too. I probably should have just said love them all! This is a great round up. The lights and the DIY table are absolutely amazing! those bow bracelets are SO easy to make, go for it! check out target for the leopard print flats i have an amazing pair that have held up for over two years and i totally wear them on a regular basis 🙂 happy wednesday! That burlap box is fantastic. I love the open frames! I adore the look of burlap and I agree that Target is calming. So is going to Barnes & Noble grabbing a coffee and reading wedding magazines. And I am not in anyway close to being engaged! I love the DIY kitchen island. How genius is that? Be sure to stop by blog for my current giveaway from Crate & Barrel. Love, love, love the bow bracelets!! And I love the DIY kitchen island project… it looks so good!! I am on the same hunt for leopard print flats but I'm going to have to go to Nine West outlet soon I think! I wore this axact outfit (but with copper flats) to work the other day and go SOO many compliments! Geez, i love pintrest! love all your pins, especially the fall outfit and burlap box! Love the DIY kitchen island!! Looks so rustic and chic! i LOVE that stairway. . . the empty picture frames?! amazing. and those lights are SO amazing, i majorly heart them!! I just realized that the staircase in my house doesn't have a banister for me to do that decor with…tear. Great pins today! cute pins! Im following you on pinterest now. nice pins! I love those lights as well. I was pining all things timeless and classic. Those empty white frames are amazing! I am in love with that staircase. So simply and elegant.